Just like the unrelated Walker Brothers a decade earlier, Sparks – comprising Californian-born real brothers Russell and Ron Mael – were unable to accomplish real success in their homeland, so both headed for UK shores and both were much more successful and thus made the UK their home. Sparks had an original sound, but for many, Ron’s moustachioed Hitler looks and frightening stares, will be more memorable. Ron and Russell were raised in the Pacific Palisades neighbourhood of Los Angeles and grew up all around music. They had attended the UCLA (University of California, Los Angeles) where Russell had studied the arts and film-making and Ron graphic art and cinematography. They lived close to the Whiskey-a-Go-Go nightclub where The Doors made regular appearances. They both developed a love for English music particularly bands like the Kinks, The Who and Pink Floyd. They got together professionally in 1968 and called themselves Halfnelson and after a few months were spotted by Todd Rundgren who himself had not long signed a deal with Bearsville records and he was so impressed with the Brothers that he urged the label’s owner, Albert Grossman, to sign them. They recorded one self-titled album which Todd produced, “It was intimidating for us just to be in a studio,” Ron explained to Soundonsound, “But he was really incredibly open to what we were doing, and I think we really felt like kindred spirits, even though some of his own music was kinda maybe more soul-based.” Russell added,”It all went incredibly well with him personally and musically. To his credit he didn’t wanna change what we were doing, he just wanted the fidelity to be a little better. So we were going into an expensive recording studio with Todd, but still banging on cardboard boxes and all. He could see that the recording process was kind of a part of what we were.” The album wasn’t well received and so they signed a new deal with Warner Brothers and also changed their name to Sparks, the reason being that both Ron and Russell were fans of the Marx brothers and made it a play on their name. Muff Winwood, Steve’s brother, produced the track and the parent album Kimono My House, when it was finished he played it to his friend Elton John, Elton wasn’t overly impressed and made a bet with Muff that the song would never crack the UK chart. I was unable to verify how much the bet was for, but I’m sure it wasn’t just a couple of quid, but Elton was wrong, the song peaked at number two behind the Rubettes’ Sugar Baby Love. The album sleeves featured two Japanese geisha girls, the one of the right being a Japanese actress called Michi Hirota, she explained how she came to be on the cover, “I was an actress with a Japanese theatre company in Europe and the USA and my husband Joji Hirota was musical director. A record company approached our director looking for Japanese women, and we were asked to do the modelling. The other lady, Kuniko Okamura, and also a member of our theatre.” Incidentally Michi cropped up again six years later when she was invited by David Bowie to provide vocals on It’s A Game, the opening track on his 1980 album Scary Monsters and Super Creeps. Sparks were invited to appear on Top of the Pops but had to wait two weeks because the brothers had to sign up to the British Musicians’ Union before they could perform on the show. When they did it was very memorable, more for Ron who used to sit almost motionless dishing out evil stares everything a camera picked him up. I actually knew someone who used to hide behind the sofa when they were on. It even prompted John Lennon to quip “Look, it’s Hitler on the telly.” It was after their debut appearance record sales shot up and their career was off and running. Everyone bangs on about how Queen’s Bohemian Rhapsody was the first promo video to feature on Top of the Pops, it wasn’t. 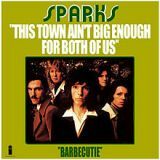 The first was almost undoubtedly the Beatles’ Strawberry Fields forever in 1967, but Sparks also did one for This Town Ain’t Big Enough for Both of Us. It was filmed at Beaulieu Palace House, Lord Montagu’s country estate in Beaulieu, Hampshire and was directed by Rosie Samwell-Smith, the then-wife of Paul Samwell-Smith who was the bass player in the Yardbirds. Sparks are still together and have released 23 albums but have only charted six (four in the seventies and two in the 2000s), and a dozen hit singles, but none as successful as their debuts. Their 1997 album Plagiarism – an album of covers of their own songs, some with other artists – features two new versions of This Town Ain’t Big Enough for Both of Us, one as an instrumental produced by Tony Visconti and the other as a collaboration with Faith No More. In 2015 they launched a joined venture with Franz Ferdinand and called themselves FFS and released a self-titled album which reached number 17. This Town Ain’t Big Enough for Both of Us returned to the top 10 in 2005 via a cover version by British Whale who was actually the Darkness’ Justin Hawkins under an assumed name. ← George Martin dies at 90.